Sweet chilly sauce is a common condiment and sauce in the western, Thai and Malaysian cuisine. Commonly used for seasoning stir fries or as a dip for fried snacks or to smear on sandwiches and rolls. The uses can always be to suit personal taste as I have liked Thai sweet chilly sauce with my omelets too. But this one is a slight variation of Thai sweet chilly sauce. This sweet chilly-ginger and tamarind sauce is a versatile sauce owing to it's ketchup like consistency. Actually when I gifted this sauce to a friend, she thought it is a tomato ketchup. Tamarind and ginger make this sauce quite interesting in the taste. It suits both Indian dishes as well as western style stir fries or as a dip. 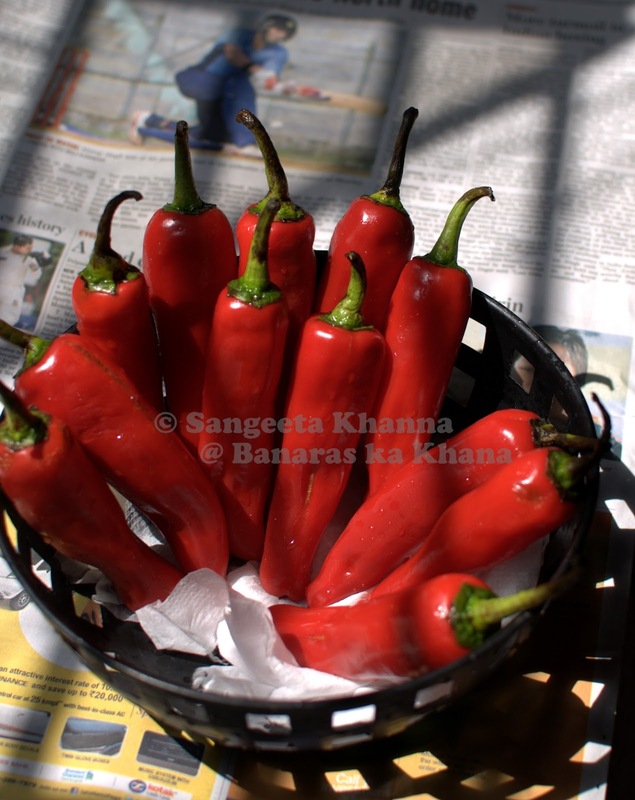 Big fat red chilies of the cayenne pepper variety, are in season normally from January to March in the north of India and people use it to make stuffed red chilly pickle mostly. 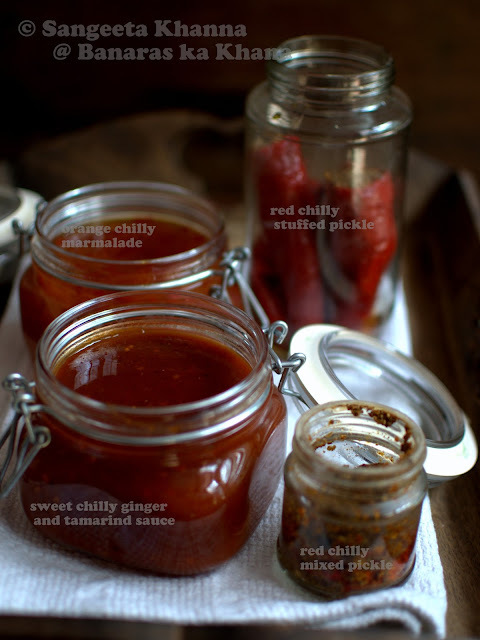 I use this variety of chilly to make chilly jam and orange or kumquat and chilly marmalade mostly. I also use this chilly as a substitute for red bell peppers to get a capsaicin flavor in my stews and salads sometimes as the husband is intolerant to bell peppers. Have a look what all I made using these chilies. This sweet chilly-ginger and tamarind sauce has become quite popular as an all rounder sauce at home. I don't do any straining when I make this sauce, except for the straining of the tamarind pulp after soaking seedless tamarind in hot water for an hour. Soak tamarind for an hour in 2 cups of hot boiling water and strain the pulp in a wide pan after mashing it properly. Remove stalks from the chilies and chop roughly. Clean the ginger root and chop roughly. Puree the ginger and red chilies together in a blender. Now keep the pan with strained tamarind pulp on gas stove. Add the chilly and ginger paste and the jaggery and salt and heat to boil the mixture. It becomes a little frothy first, lower the heat after this and simmer on low flame for about 45 minutes. It can take a little more time to reduce and become the consistency of ketchup. You can reduce it further to a jam like consistency. And the sauce is done. 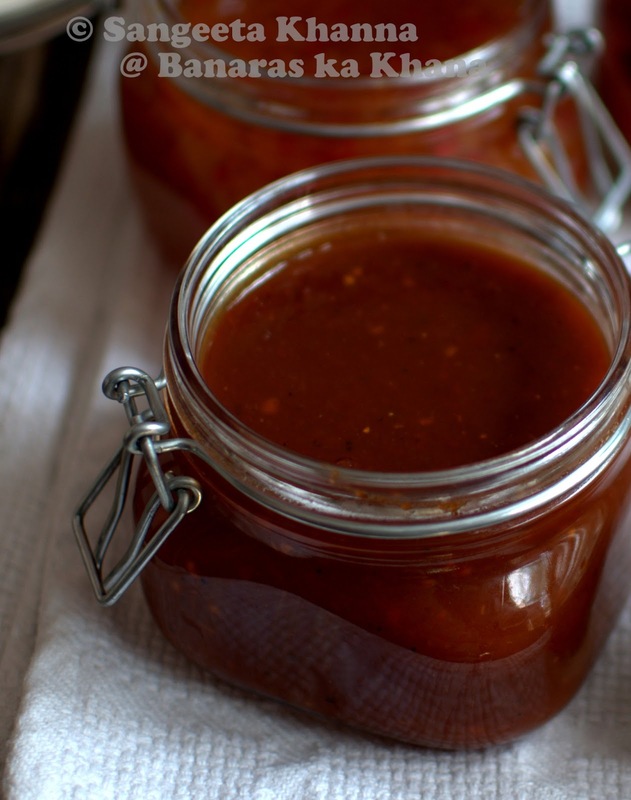 It is an easy sauce to make and you will be spared from many preservatives colors and texture enhancers used in commercial ketchup and sauces. 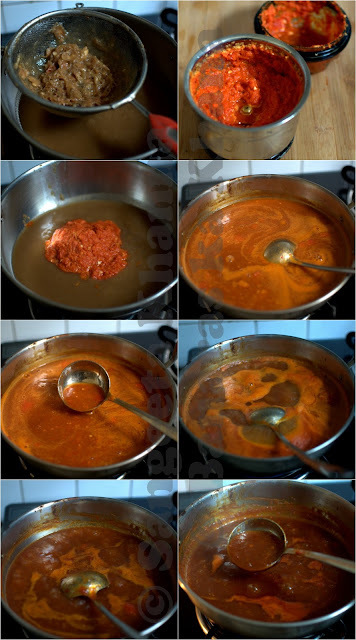 You might like to to strain the sauce half way into the cooking and then reduce it to desired consistency. Fill the sauce in sterilised jars or bottles. This recipe makes about 900 ml of sauce. The sauce stays well on room temperature for about 4-5 months. Or keep it refrigerated if you live in a humid area or the jar keeps opening frequently. Using clean and ry spoons will be better or use squeezy type bottles if you wish to prevent contamination. There are bits and pieces in this sauce since I haven't strained it after cooking the chilies and ginger etc but I like it this way. This way the sauce is not suitable for squeezy type bottles. We like this sauce with our dahi bhalle chaat, as a dip for crackers, as a sauce for pakodas and even with parathas and omelet sometimes. I am sure you would love this sauce, especially if you have kids at home. Many friends have been requesting me to make this sauce on a commercial scale and sell it in friends' circle. Yes, this sauce is that good. I will be making this sauce more and more to gift my friends and family as homemade gifts feel more personal to me. Oh, man! I'd use this sauce to dip sinful fried things into. Or top chaats with. Looks lovely! 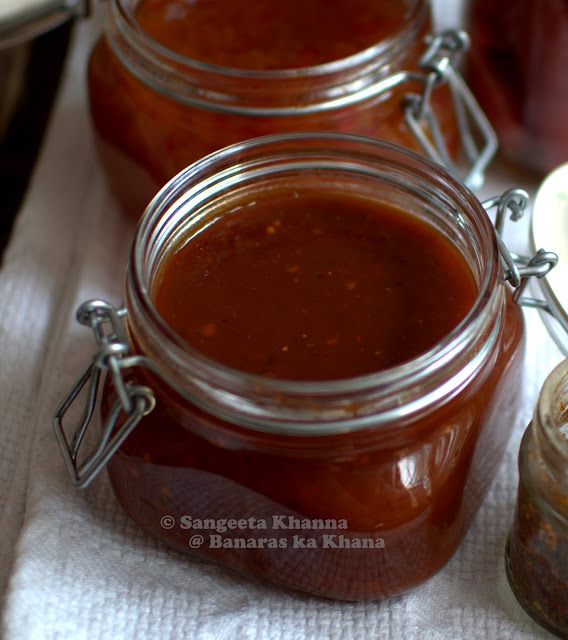 Never tried making this tamarind chutney with fresh red chilies,surely the taste may be different..looks tempting ,will try this surely! Love the combination. This looks delicious!! Must taste great with Indian snacks. I hope our Indian grocery decides to bring this in Sangeetha! Never tried with fresh chillies but pics are so completely forcing me to try it. Hey, pl post the orange marmalade recipe before orange season gets over. I would like to bank upon the orange preserve once fresh ones are gone. Did I tell you that I tried 'haridwar ki kachori' and 'aalo ki sabji' on HOLI .it was a great hit. I have added the link to the orange/kumquat - chilly marmalade in the third paragraph of this post. Check that out, the marmalade is easy to make as well. Lovely pics!! If i could i will grab that cute jar with sauce from the pic!!! eeeeeks....clumsy me. Did not notice it earlier. Thanks. do we boil the seeds of orange too ? the kumquat seeds look different from orange seeds. Do orange seeds also contain pectin? there is one more orange and other citrus fruits marmalade posted on the other blog, you can check out the basics there.